Life is a bit tricky at this stage in Sapporo. Missing Australia, mom, Olga, Mark my little niece Maria Viviian Rose xoxo. I have not met the darling yet!!! Cannot wait! I was in Sapporo when she was born 3 and a half months ago!!! One day just suddenly I had arrived in Sapporo and lived in Makomanai Komaoka, for about 5 months then had to go back to Australia for family reasons. When came back to Sapporo second time, I lived in Tsukisamu and now I live in Minami Hiragishi. I would love to live in Sapporo, hence, been coming and going for about a year. I love Japan so much! The culture is very deep and there are so many delicate intriguing things to learn here. The list is countless. What draws me my family to Japan is that we, once mom, younger sister and father (passed away in 1999) used to live in Ishikawa prefecture Kanazawa Shi for four and a half years!! This was a long time ago already 22 years ago! I was born in Ukraine but when the Chernovyl big disaster happened, lucky my parents found work in Mexico. We managed to live in Mexico for about two years before moving to Ishikawaken Kanazawa City. I was only very young at this age, but seem to have developed deep interest in Japanese language and culture. At the age of roughly 15 we, again as family we moved to Western Australia where we were granted Citizenship. My father had passed away at this time from cancer. My mother is a top specialist in music and cancer survivor too! We went through a great deal in life ( I will leave it to your understanding and imagination of the giant hurdles in life we all went through..) but its where it led me in life to have a fantastic experience to study not only in in Japan but also at the University of Western Australia. Had a perfect opportunity to take on a Language and Psychology Project at Kanazawa University through obtaining a four year Monbukagakushou Japanese Government Scholarship. I could not accept the scholarship at that time in my life because of family circumstances. My dream to come back to japan never stopped. My mother always reminds me of obtaining and not taking Government scholarship to Kanazawa university, ohh so much opportunities… Still are in life!!! Never ever give up and regret decisions that you choose in life. Just choose wisely!! If I had chosen to go to Kanazawa University I would not be in Sapporo!!! Blogging can be really great, in fact it is! Lets share our life little happenings especially exiting ones! You must all know, by now, that I'm moving back to Europe next month. That's the 6th time I'm moving out and the 5th time I'm moving abroad! You'd expect me to be used to it, to be a pro mover, to master the art of packing-unpacking-repacking! Nay! I may deceive you but no, I'm not! Every time I'm facing the harsh reality of moving out I ask myself the following question : why on earth do I have so many stuffs?! Though, I promise myself to keep the bare necessities of life every time I'm moving in, I somehow end up keeping things "for future use", things that I had forgotten about and ended up buying in double or triple. However there is one thing I've learnt : relaxing! I used to get all worked up weeks before moving to my new home and pre-pack to make sure that everything would fit in my suitcase only to realize that I had forgotten something the last minute. So here I am, 5 weeks away from the D-day, sitting on my couch, watching TV , surrounded by all the stuffs I've collected and kept during the past 4 years and I'm not worried a bit! It's ok, I still have 5 weeks to get ready, that's more than enough! And these wise words will end my last post after 3 years and a half at the chit chat cafe! All the best to everyone and wish me luck! It's been 6 months since first arriving in Japan last year and I'm finally feeling settled. It was hard at first, but after a while, things got a lot easier. I'm now looking ahead at things to do and places to explore in Hokkaido, so if anyone has any recommendations, please chat with me next time you see me in the cafe! When living in England, I was so bored. But living in New Zealand for two years helped me find the joy that comes from meeting new people, trying different things and exploring. I've tried to keep this momentum since arriving in Japan, but culture shock slowed me down a lot. But the good news is that I'm slowly adjusting to living in Japan and all of you at the cafe have actually helped me a lot, so thank you! So now, as we enter Golden Week, I'm feeling good and looking forward to will happen in May. I've recently taken up a couple of interests, namely, photography and leather craft and I'm hoping that I'll get better at both of these things in the next month. I'm exploring the many places to have some nice food, from Hemp parfait's to delicious sushi. If anyone knows of a good place, please tell me! 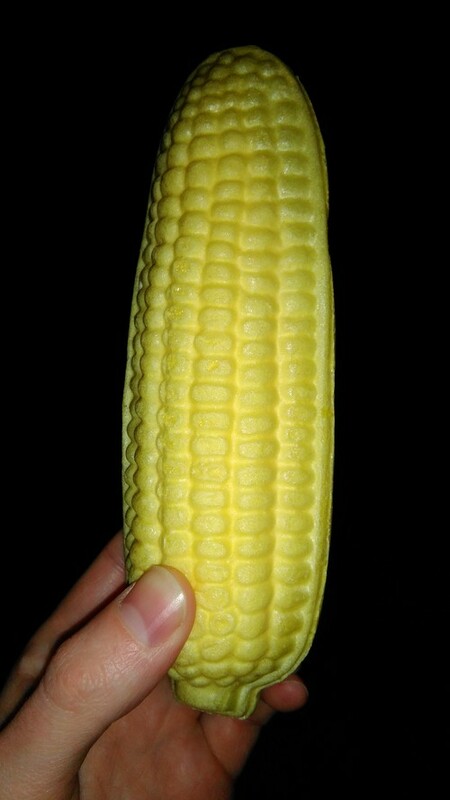 Along the way, I'm buying anything that looks interesting, like corn-on-cob ice cream! 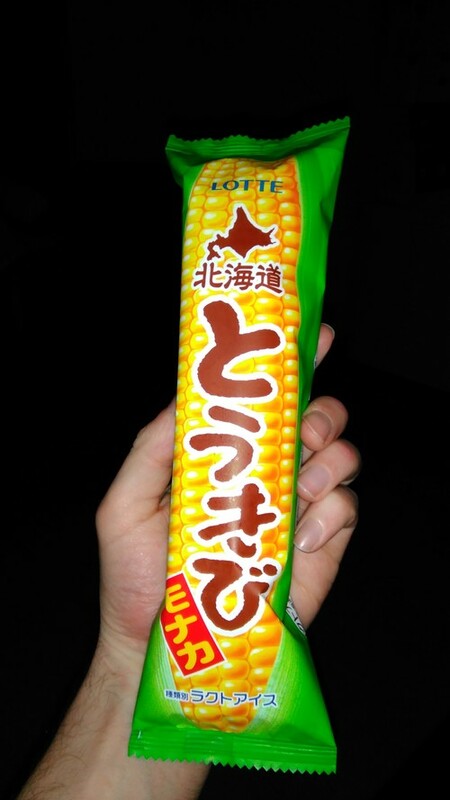 It's actually pretty good...and healthy as well, because it's sweetcorn! !